LG today unveiled its latest phone in Vu series called LG Vu 3. The LG Vu 3 has a bigger screen then its older sibling the LG Optimus Vu 2. 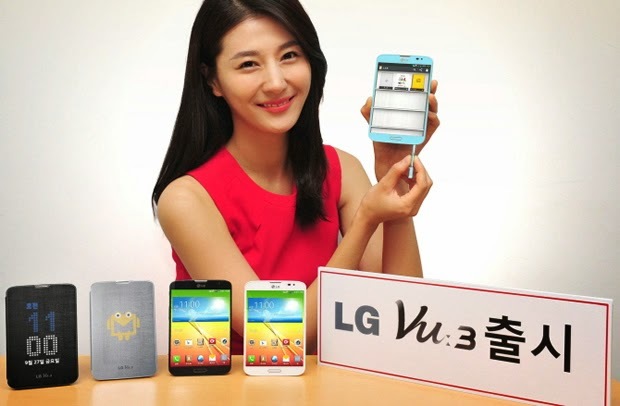 The LG Vu 3 will have a nice big 5.2 which will give a 1280 x 960 pixels resolution and have a 4 : 3 aspect ratio. The Vu 3 will run on Android 4.2.2 Jelly Bean and pack a 2.26GHz quad-core Snapdragon 800 processor. Vu 3 will be a 4G LTE phone and will have a 13MP rear camera with auto focus and LED Flash. The front camera will be a 2.1MP affair. It will be 0.2 inches larger then the LG Optimus Vu 2 as per LG spokesperson and will also come with a Rubberdium stylus that's as thick and as sturdy as a real pen. The phone is slated to go on sale in Korea on September 27 and should reach other parts of the world by October 2013.